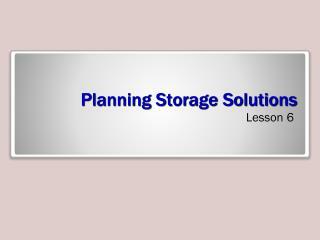 Planning Storage Solutions. Lesson 6. Skills Matrix. Server Storage. 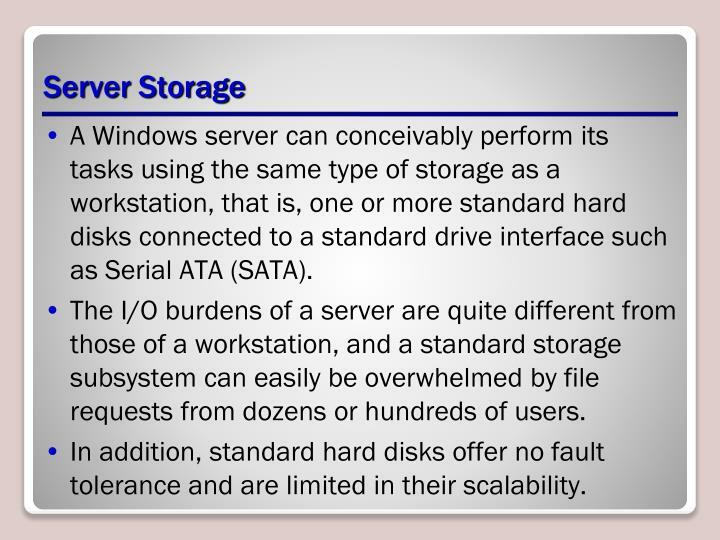 A Windows server can conceivably perform its tasks using the same type of storage as a workstation, that is, one or more standard hard disks connected to a standard drive interface such as Serial ATA (SATA). 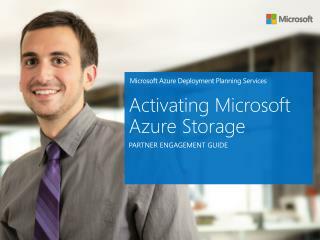 A Windows server can conceivably perform its tasks using the same type of storage as a workstation, that is, one or more standard hard disks connected to a standard drive interface such as Serial ATA (SATA). 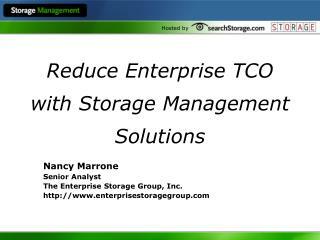 The I/O burdens of a server are quite different from those of a workstation, and a standard storage subsystem can easily be overwhelmed by file requests from dozens or hundreds of users. 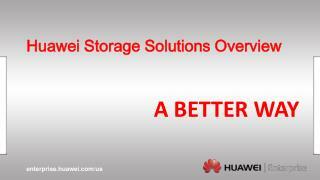 In addition, standard hard disks offer no fault tolerance and are limited in their scalability. The amount of storage the server needs. The number of users that will be accessing the server at the same time. 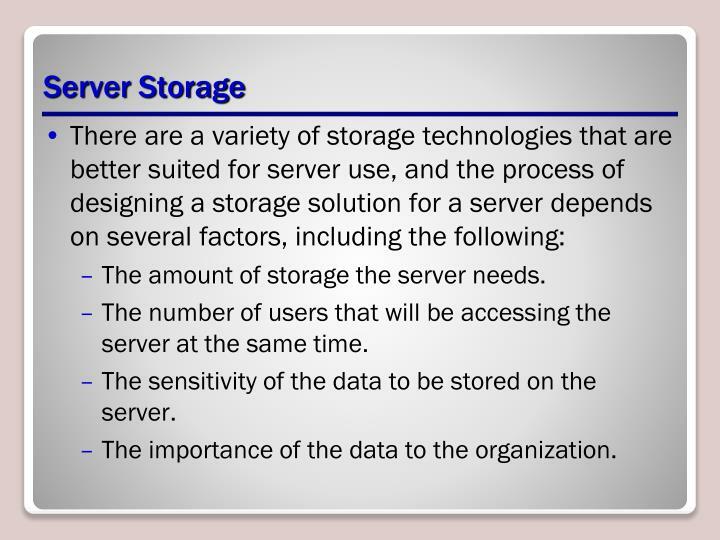 The sensitivity of the data to be stored on the server. 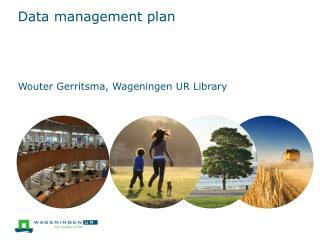 The importance of the data to the organization. 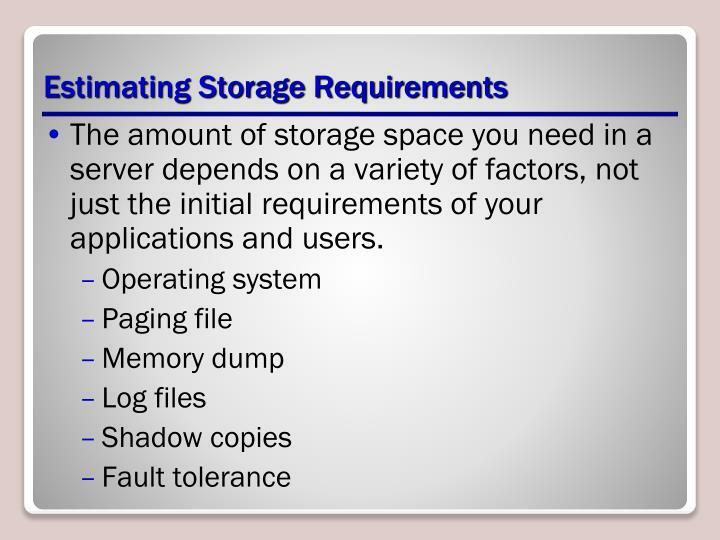 The amount of storage space you need in a server depends on a variety of factors, not just the initial requirements of your applications and users. 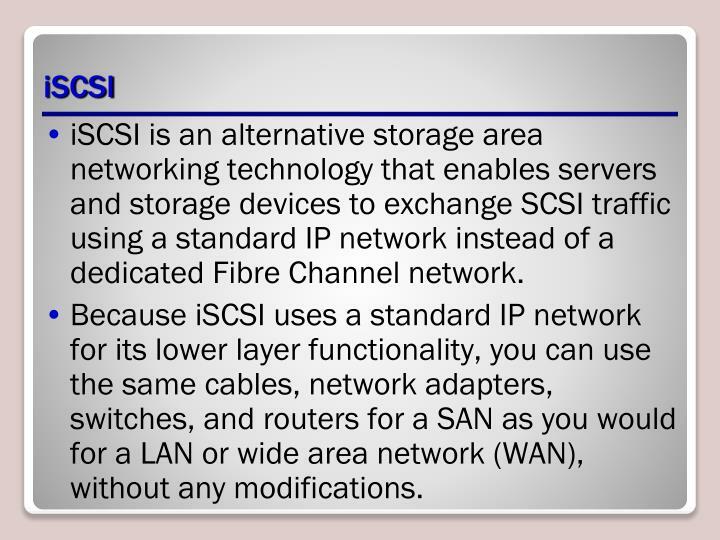 To use SCSI on a server, all of the devices and host adapters must support the same standard. You connect SCSI devices to a host adapter using a daisy chain cable arrangement called a SCSI bus. Many host adapters enable you to connect both internal and external devices, so you can expand the bus as needed, even if the computer case does not have room for additional drives. 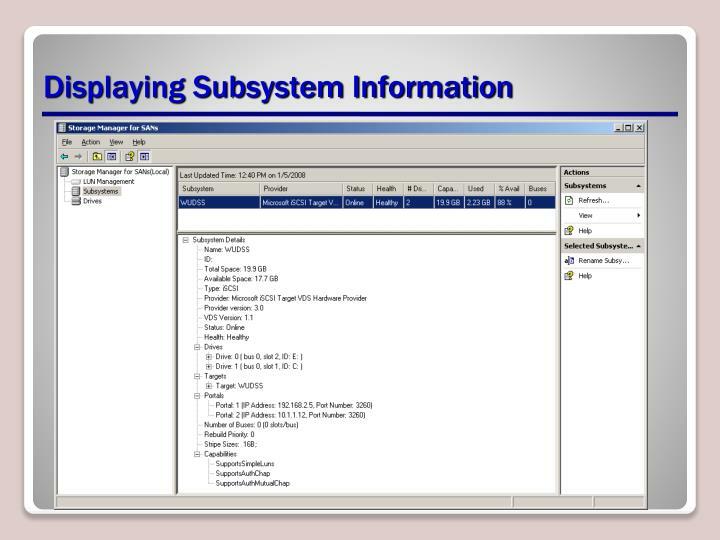 Every device on a SCSI bus has an identifier called a SCSI ID, which the host adapter uses to send commands to the device. 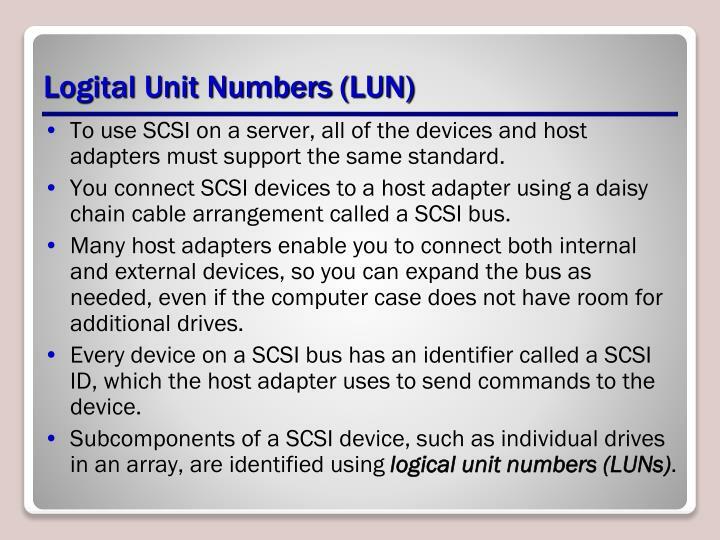 Subcomponents of a SCSI device, such as individual drives in an array, are identified using logical unit numbers (LUNs). 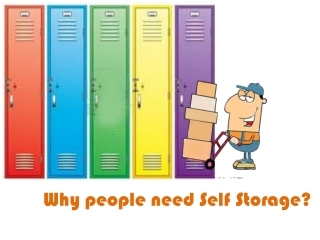 High capacity servers often store hard drives in a separate housing, called an external drive array, which typically incorporates a disk controller, power supply, cooling fans, and cache memory into an independent unit. 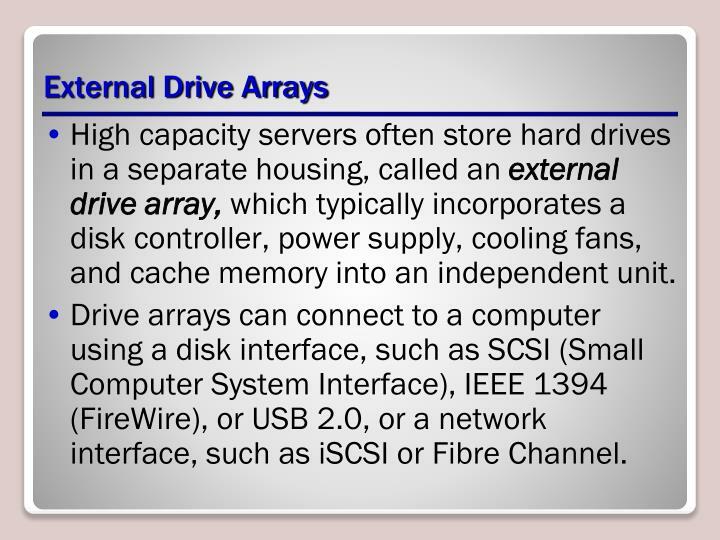 Drive arrays can connect to a computer using a disk interface, such as SCSI (Small Computer System Interface), IEEE 1394 (FireWire), or USB 2.0, or a network interface, such as iSCSI or Fibre Channel. 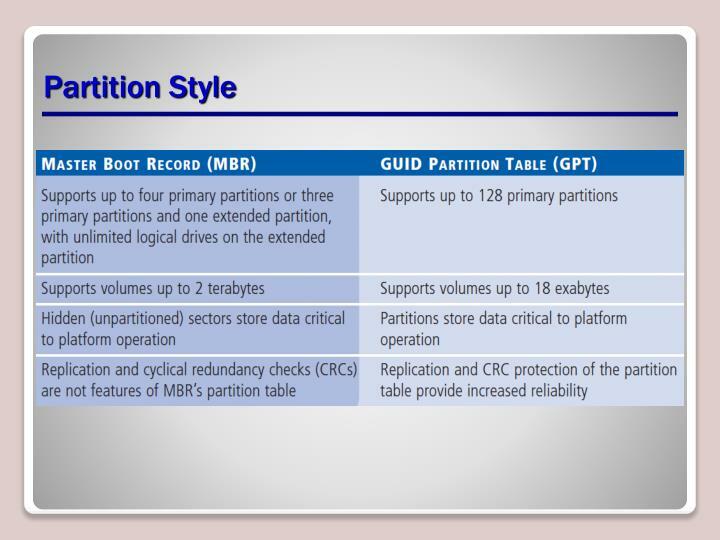 Select a partitioning style (MBR or GPT). 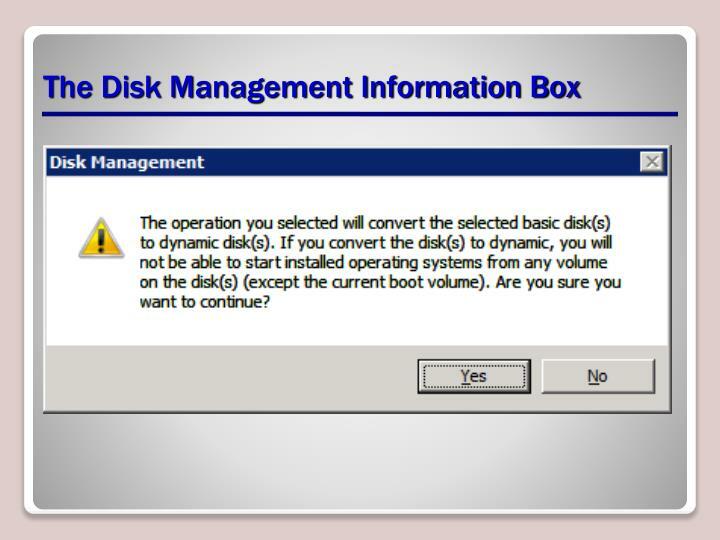 Select a disk type (Basic versus Dynamic). 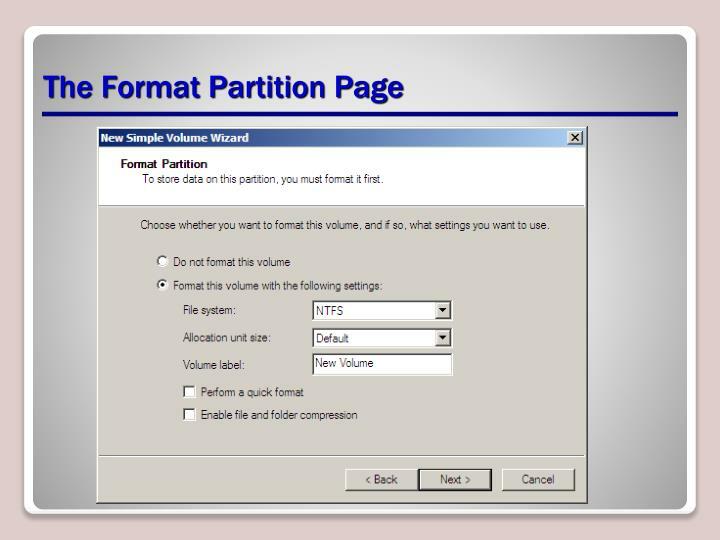 Divide the disk into partitions or volumes. 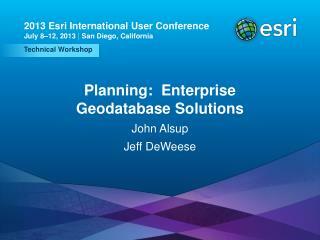 Format the partition with a file system. 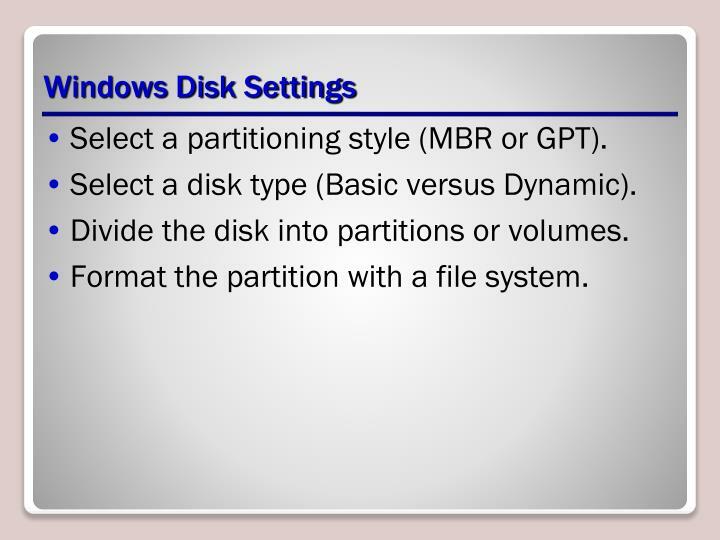 MBR — The MBR partition style has been around since before Windows and is still the default partition style for x86-based and x64-based computers. 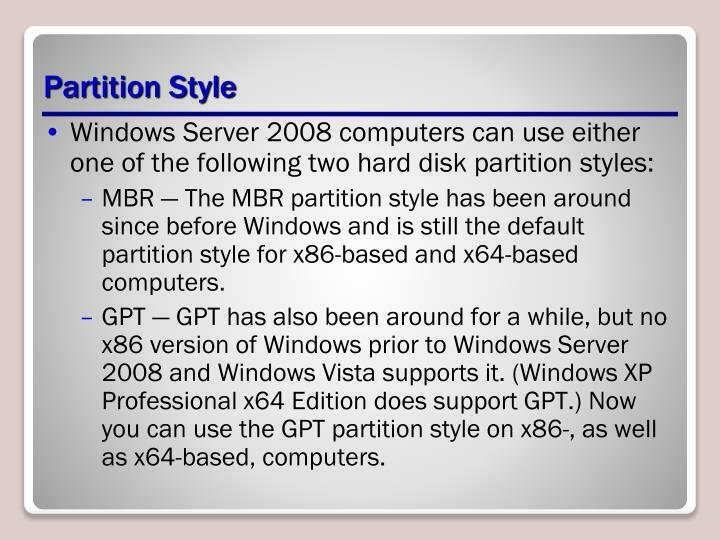 GPT — GPT has also been around for a while, but no x86 version of Windows prior to Windows Server 2008 and Windows Vista supports it. (Windows XP Professional x64 Edition does support GPT.) 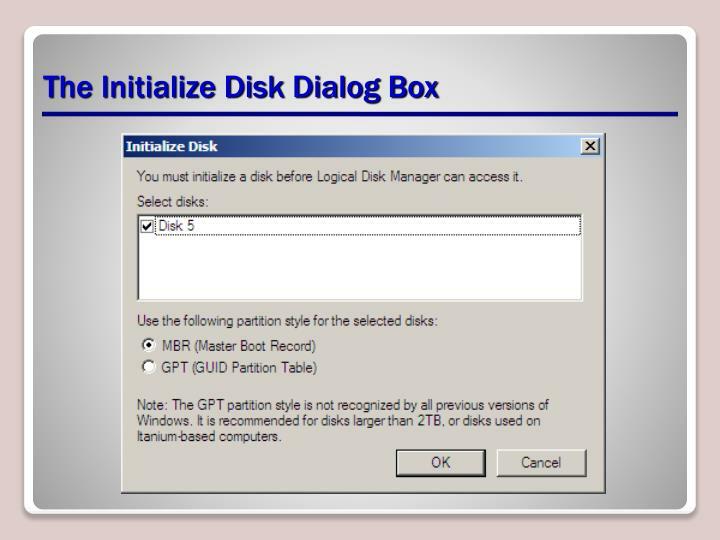 Now you can use the GPT partition style on x86-, as well as x64-based, computers. 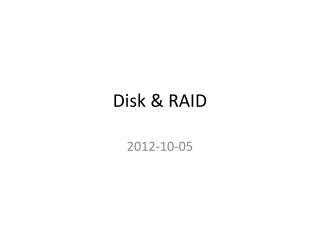 A basic disk uses primary partitions, extended partitions, and logical drives to organize data. 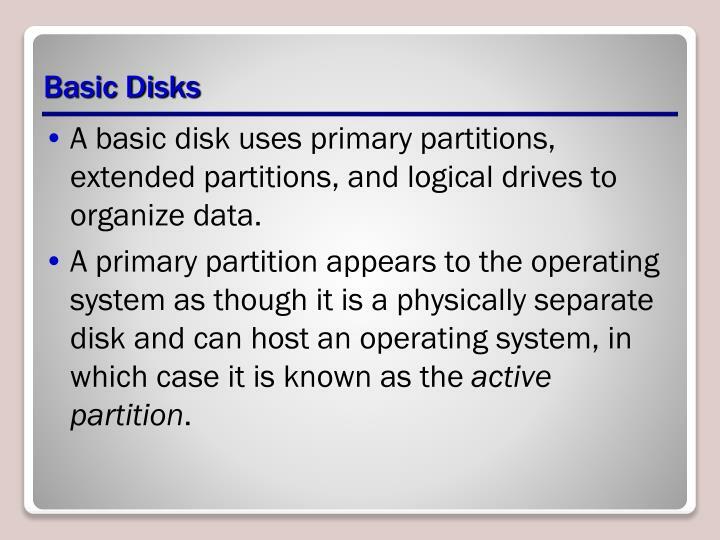 A primary partition appears to the operating system as though it is a physically separate disk and can host an operating system, in which case it is known as the active partition. During the operating system installation, the setup program creates a system partition and a boot partition. The system partition contains hardware-related files that the computer uses to start. The boot partition contains the operating system files, which are stored in the Windows file folder. 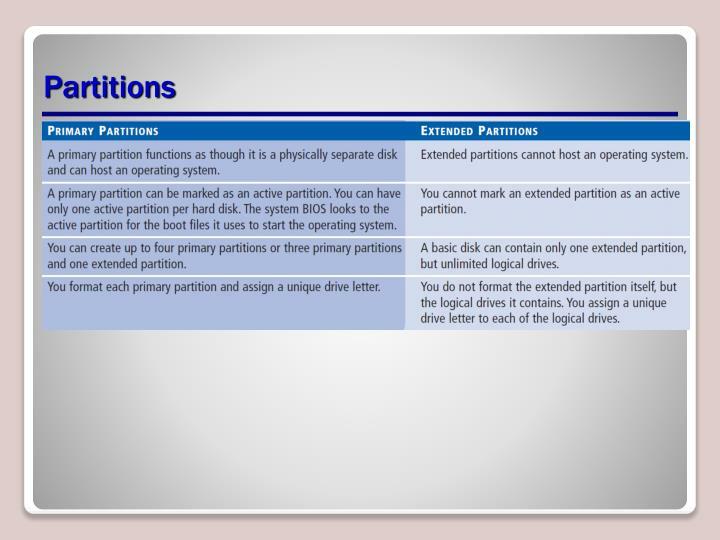 In most cases, these two partitions are one and the same, the active primary partition that Windows uses when starting. 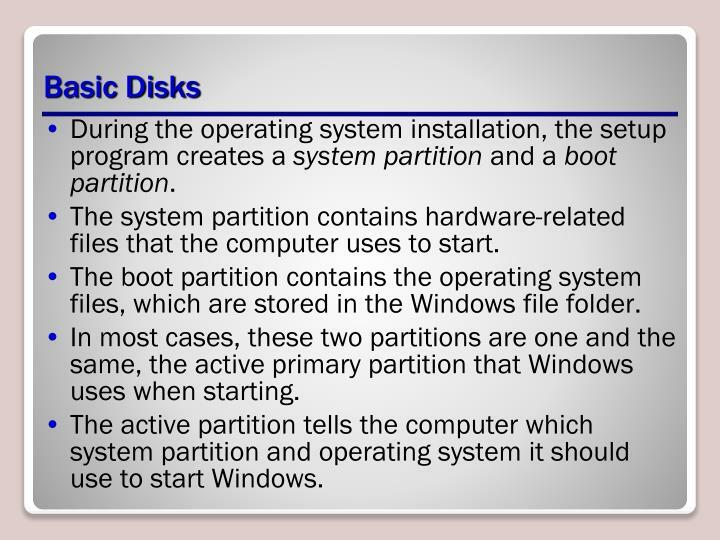 The active partition tells the computer which system partition and operating system it should use to start Windows. 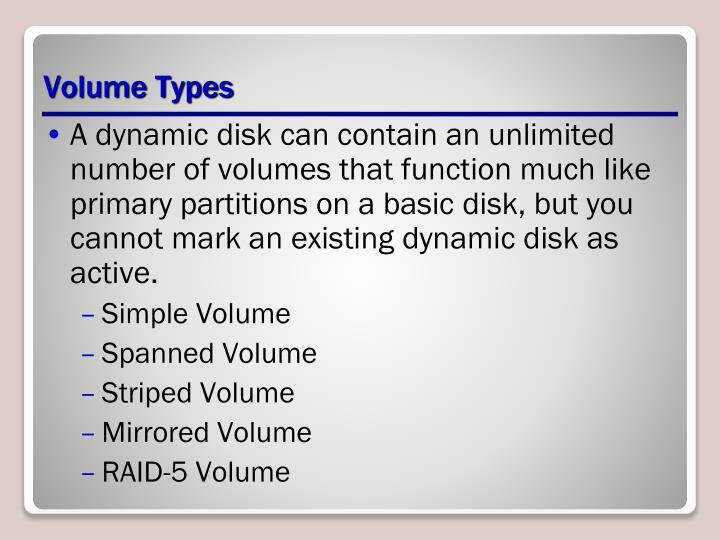 A dynamic disk can contain an unlimited number of volumes that function much like primary partitions on a basic disk, but you cannot mark an existing dynamic disk as active. 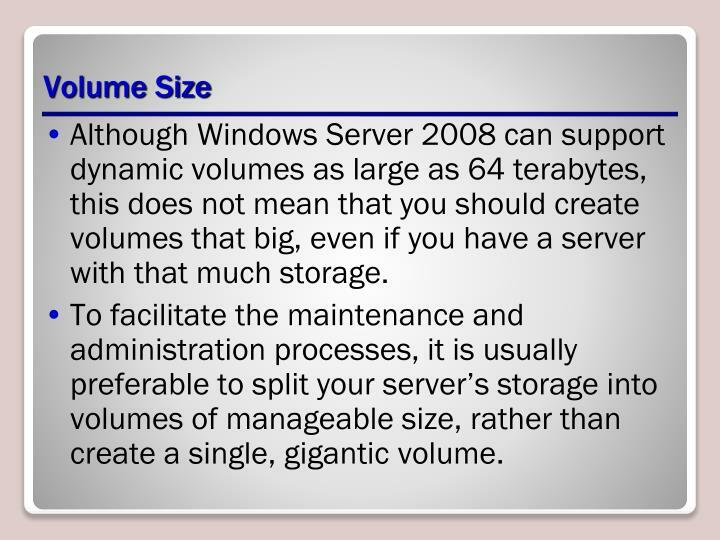 Although Windows Server 2008 can support dynamic volumes as large as 64 terabytes, this does not mean that you should create volumes that big, even if you have a server with that much storage. 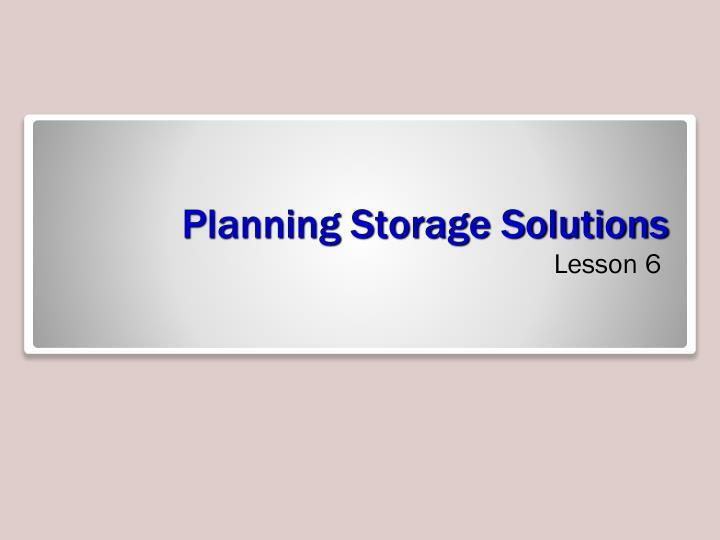 To facilitate the maintenance and administration processes, it is usually preferable to split your server’s storage into volumes of manageable size, rather than create a single, gigantic volume. 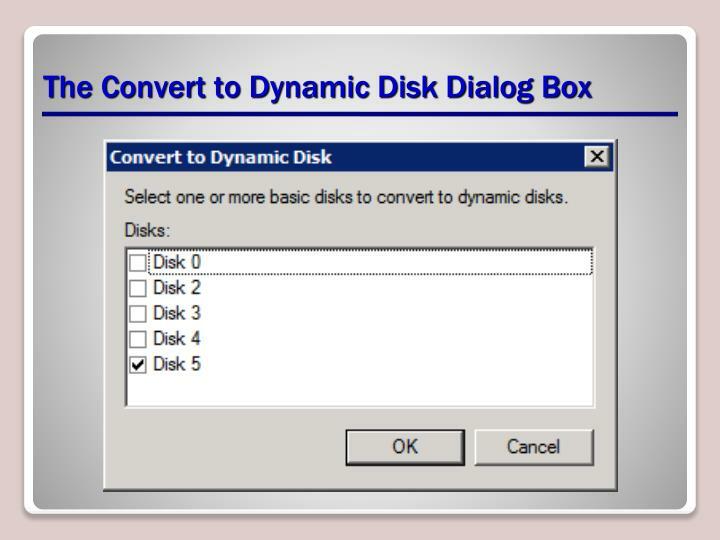 Converting basic disks to dynamic disks. Extending, shrinking, and deleting volumes. Assigning and changing driver letters and paths. 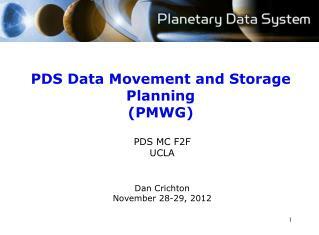 Examining and managing physical disk properties, such as disk quotas, folder sharing, and error checking. 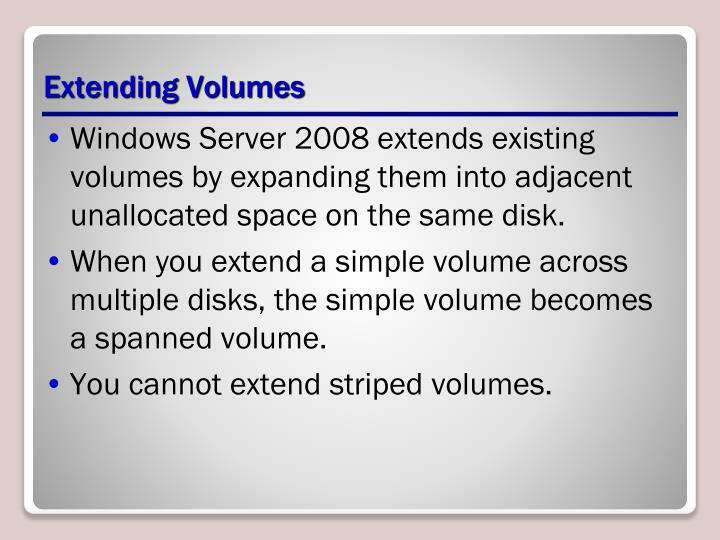 Windows Server 2008 extends existing volumes by expanding them into adjacent unallocated space on the same disk. When you extend a simple volume across multiple disks, the simple volume becomes a spanned volume. You cannot extend striped volumes. 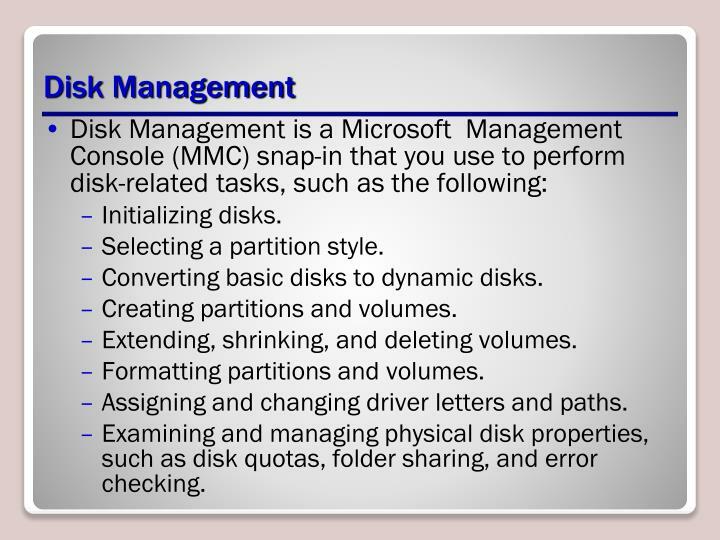 A volume of a basic disk must be either unformatted or formatted with the NTFS file system. 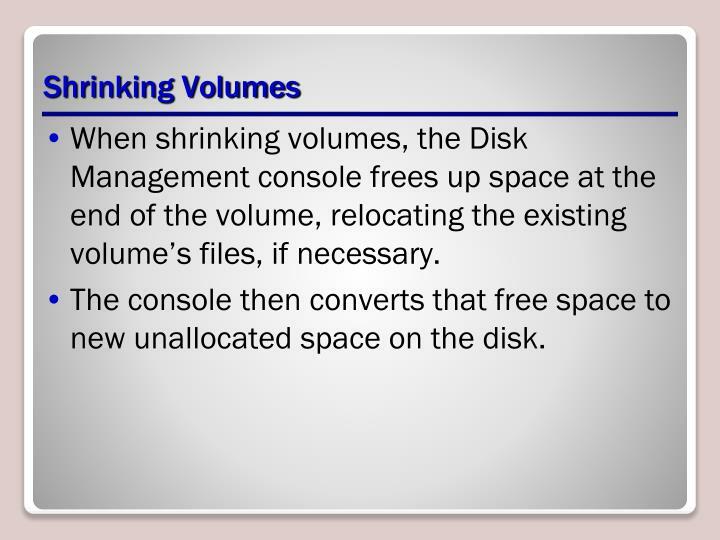 If you extend a volume that is actually a logical drive, the console first consumes the contiguous free space remaining in the extended partition. 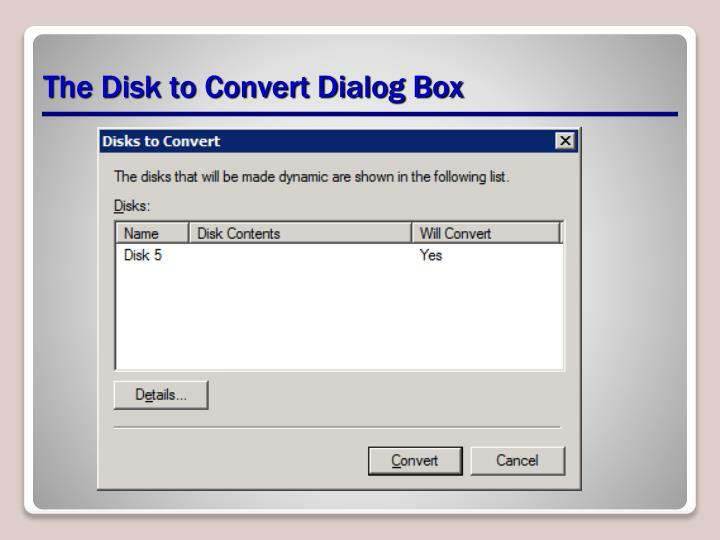 You can extend logical drives, boot volumes, or system volumes only into contiguous space, and only if the hard disk can be upgraded to a dynamic disk. 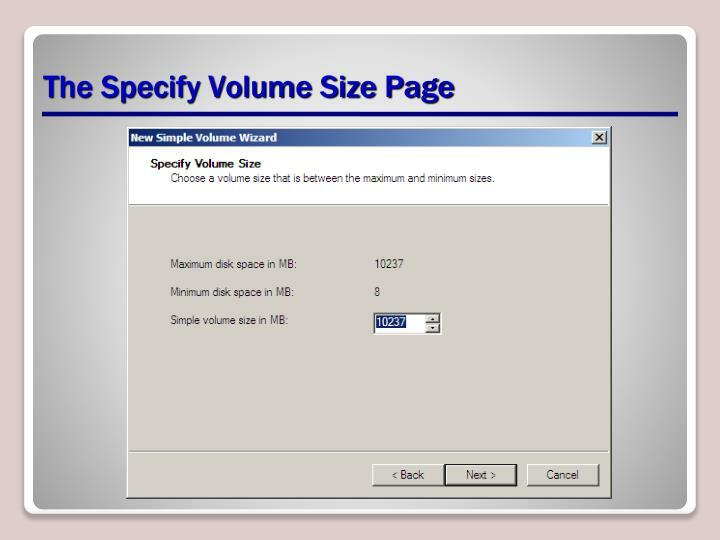 When extending a simple volume, you can use only the available space on the same disk, if the volume is to remain simple. 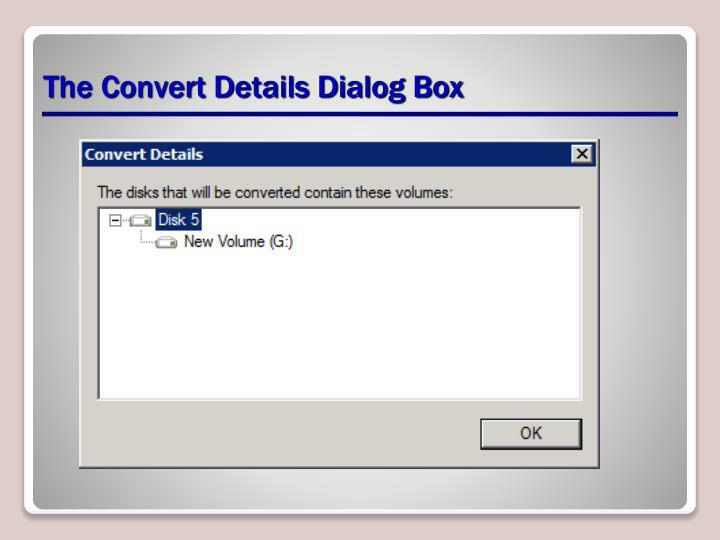 You can extend a simple volume across additional disks if it is not a system volume or a boot volume. 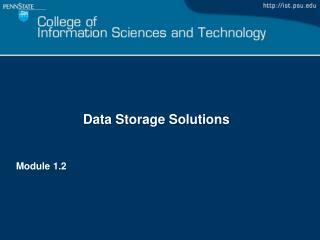 You can extend a simple or spanned volume if it does not have a file system (a raw volume) or if you formatted it using the NTFS file system. 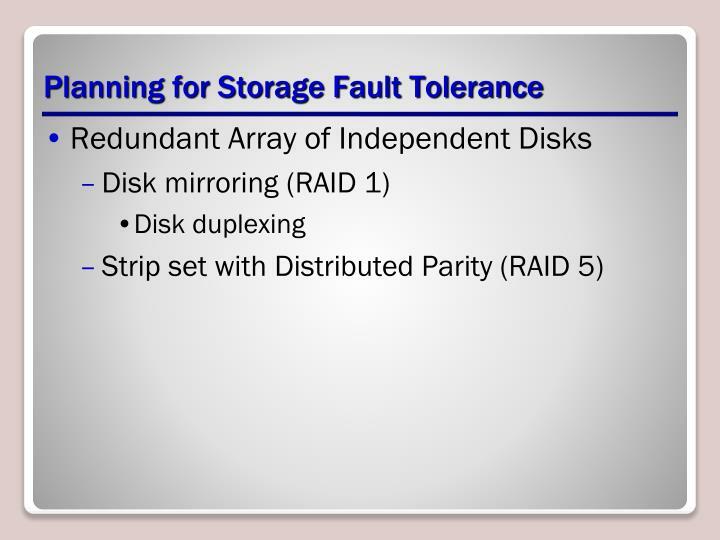 You cannot extend mirrored or RAID-5 volumes. 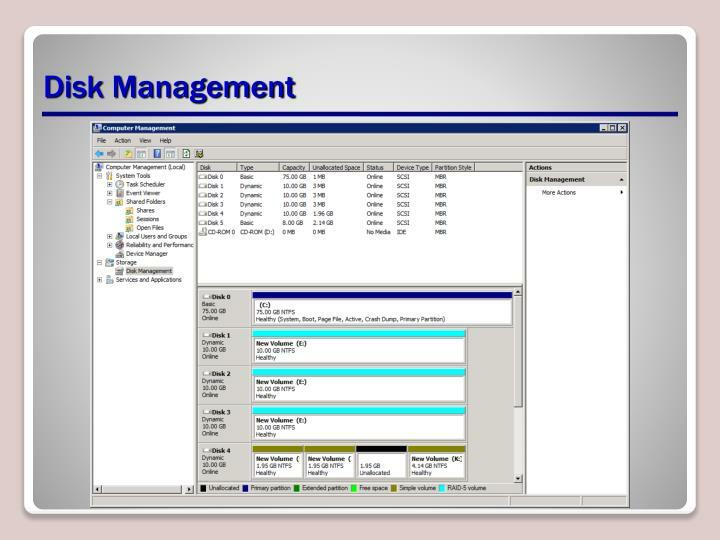 When shrinking volumes, the Disk Management console frees up space at the end of the volume, relocating the existing volume’s files, if necessary. The console then converts that free space to new unallocated space on the disk. 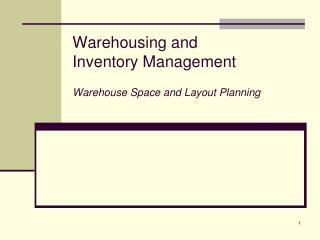 The existing volume must not be full and must contain the specified amount of available free space for shrinking. 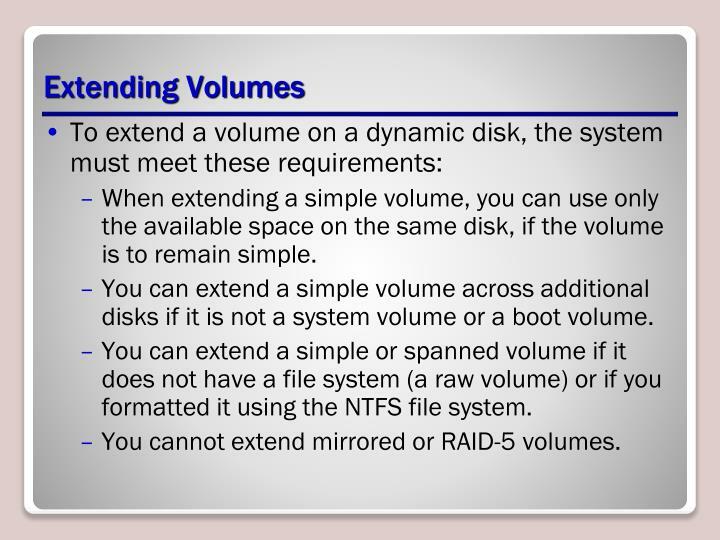 The volume must not be a raw partition (one without a file system). 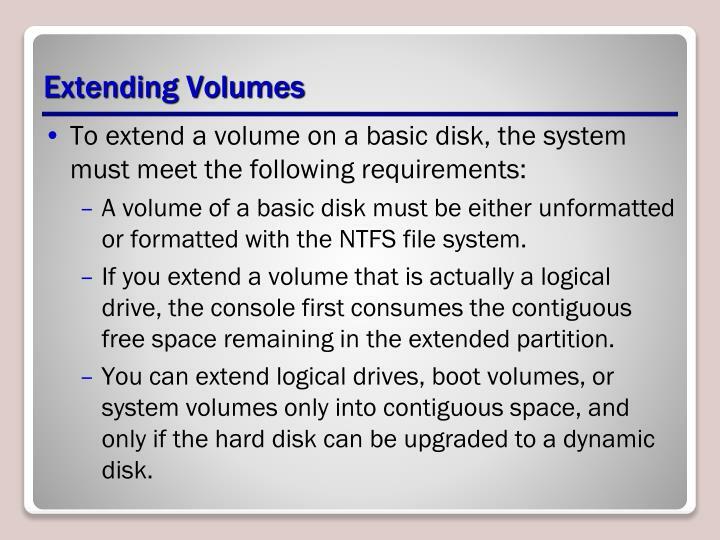 You can shrink a volume only if you formatted it using the NTFS file system. 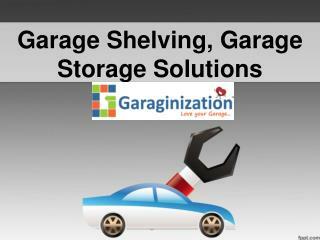 You cannot shrink striped, mirrored, or RAID-5 volumes. You should always defragment a volume before you attempt to shrink it. 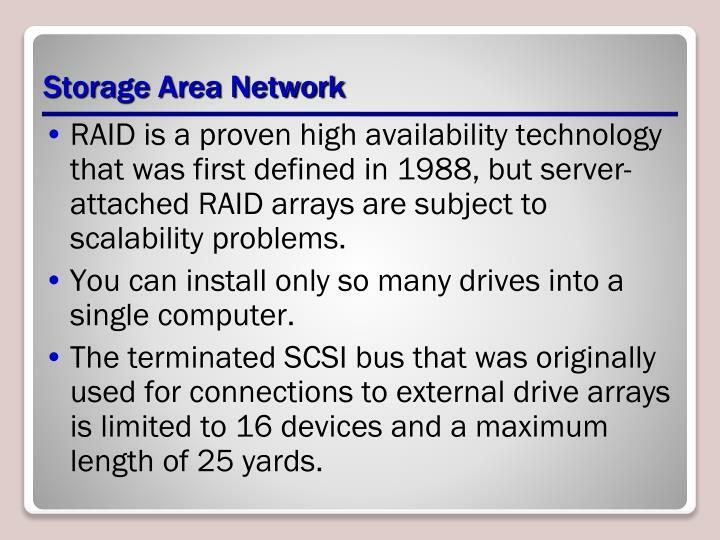 RAID is a proven high availability technology that was first defined in 1988, but server-attached RAID arrays are subject to scalability problems. You can install only so many drives into a single computer. 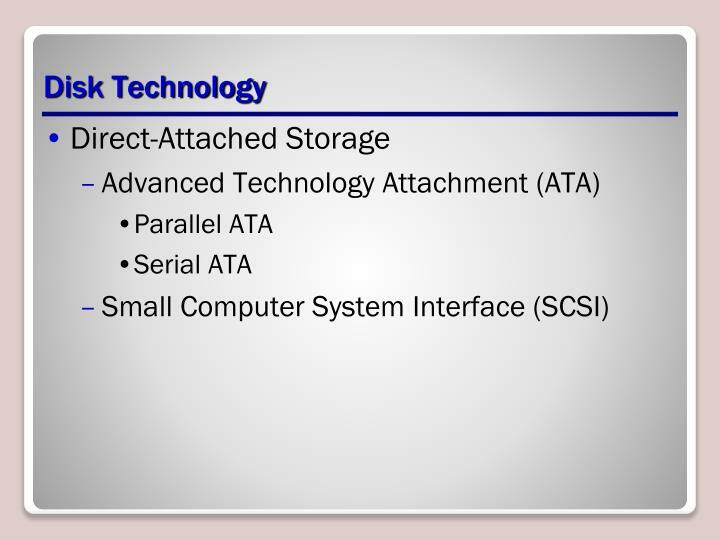 The terminated SCSI bus that was originally used for connections to external drive arrays is limited to 16 devices and a maximum length of 25 yards. 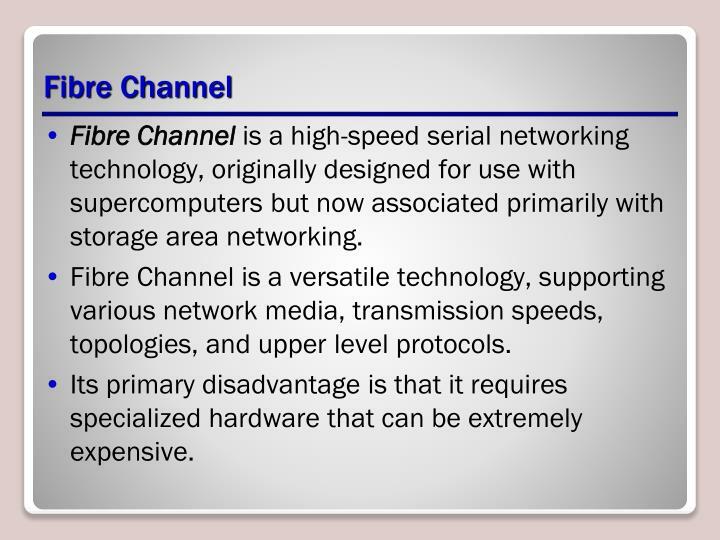 Fibre Channel is a high-speed serial networking technology, originally designed for use with supercomputers but now associated primarily with storage area networking. Fibre Channel is a versatile technology, supporting various network media, transmission speeds, topologies, and upper level protocols. 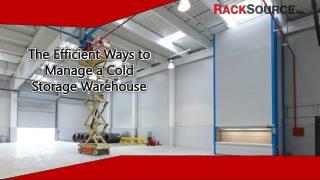 Its primary disadvantage is that it requires specialized hardware that can be extremely expensive. 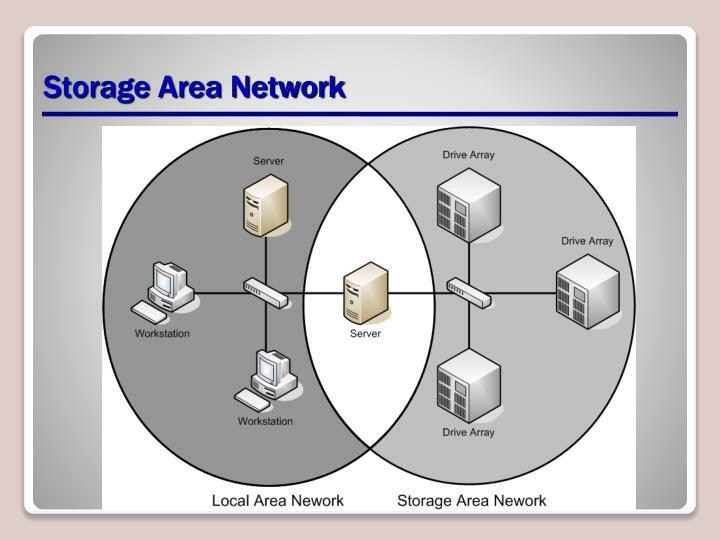 A Fibre Channel network can use a variety of network media. Copper alternatives include video or miniature coaxial cable and, more commonly, shielded twisted pair (STP) with DB-9 or HSSDC (High Speed Serial Data Connection) cable connectors. Fiber optic alternatives include 62.5- or 50-ohm multimode and 7- or 9-ohm singlemode, all using LC or SC connectors. 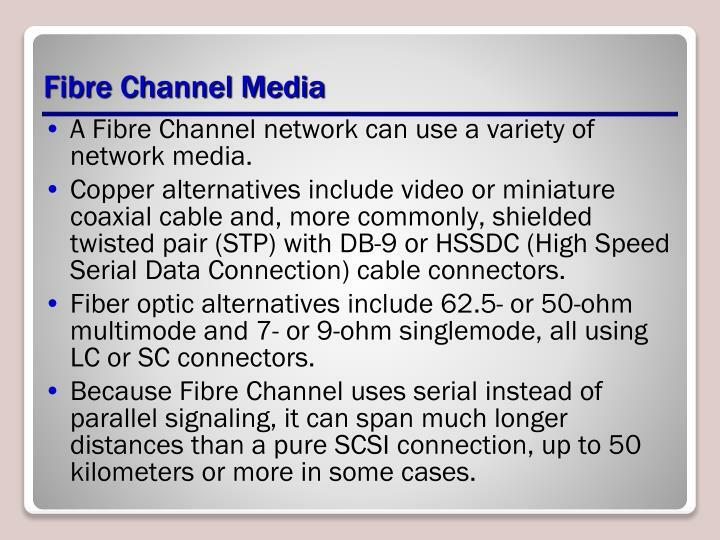 Because Fibre Channel uses serial instead of parallel signaling, it can span much longer distances than a pure SCSI connection, up to 50 kilometers or more in some cases. 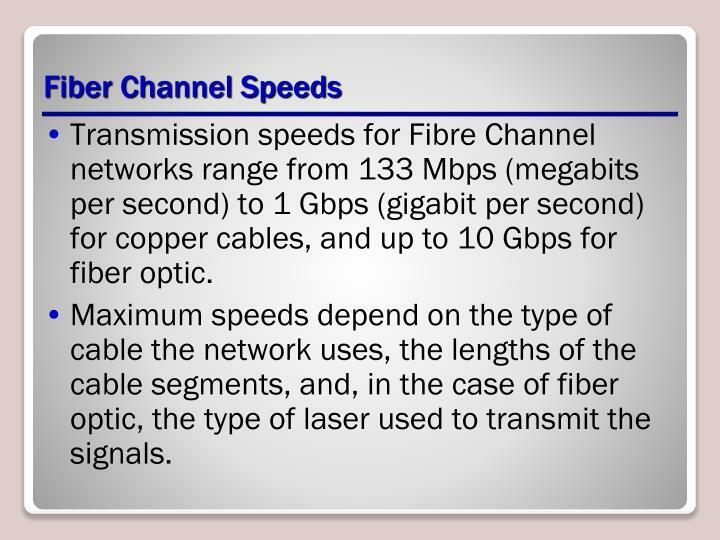 Transmission speeds for Fibre Channel networks range from 133 Mbps (megabits per second) to 1 Gbps (gigabit per second) for copper cables, and up to 10 Gbps for fiber optic. Maximum speeds depend on the type of cable the network uses, the lengths of the cable segments, and, in the case of fiber optic, the type of laser used to transmit the signals. Point-to-point (FC-P2P) — Consists of two devices only, directly connected with a single cable. 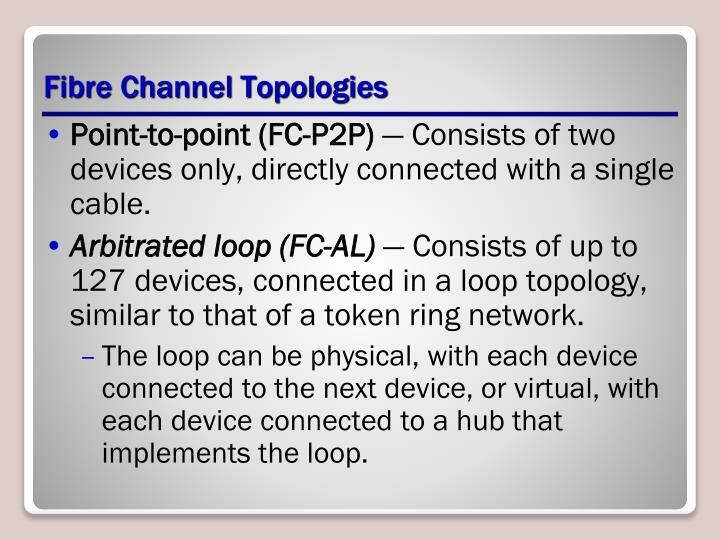 Arbitrated loop (FC-AL) — Consists of up to 127 devices, connected in a loop topology, similar to that of a token ring network. The loop can be physical, with each device connected to the next device, or virtual, with each device connected to a hub that implements the loop. 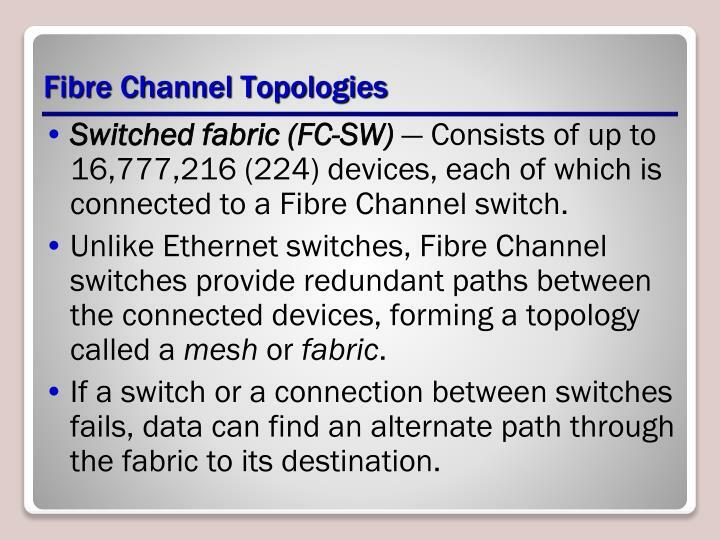 Switched fabric (FC-SW) — Consists of up to 16,777,216 (224) devices, each of which is connected to a Fibre Channel switch. Unlike Ethernet switches, Fibre Channel switches provide redundant paths between the connected devices, forming a topology called a mesh or fabric. If a switch or a connection between switches fails, data can find an alternate path through the fabric to its destination. 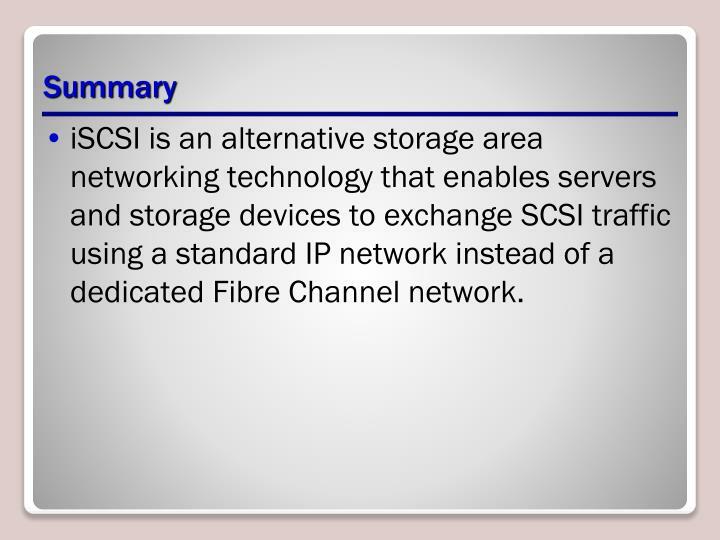 iSCSI is an alternative storage area networking technology that enables servers and storage devices to exchange SCSI traffic using a standard IP network instead of a dedicated Fibre Channel network. Because iSCSI uses a standard IP network for its lower layer functionality, you can use the same cables, network adapters, switches, and routers for a SAN as you would for a LAN or wide area network (WAN), without any modifications. 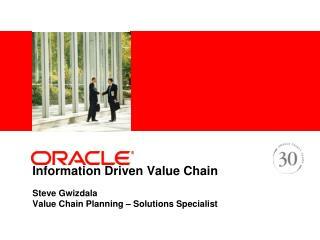 Initiates the SCSI communication process. Is a hardware or software device running on a computer that accesses the storage devices on the SAN. 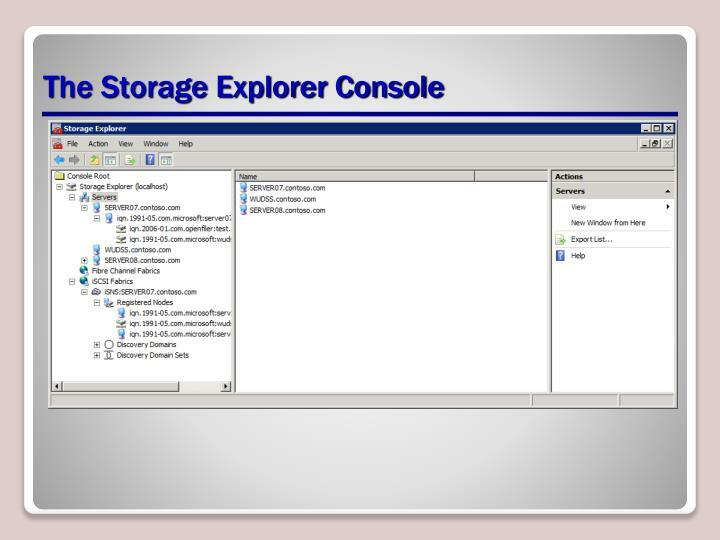 On an iSCSI network, the initiator takes the place of the host adapter that traditional SCSI implementations use to connect storage devices to a computer. 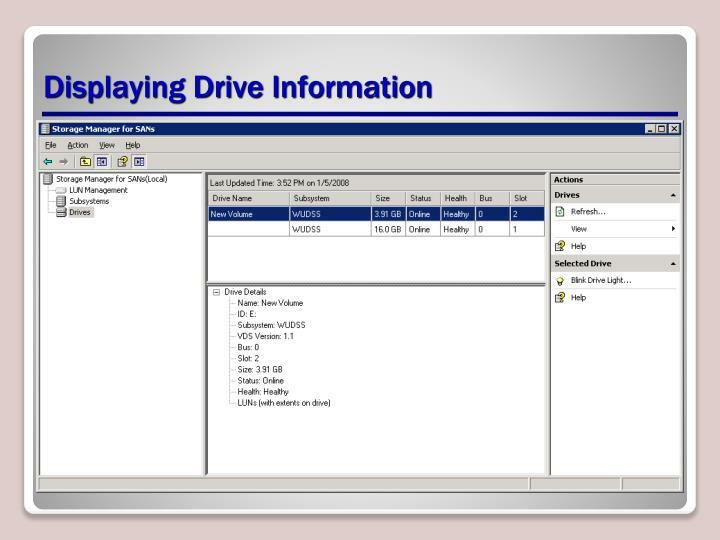 The initiator receives I/O requests from the operating system and sends them, in the form of SCSI commands, to specific storage devices on the SAN. 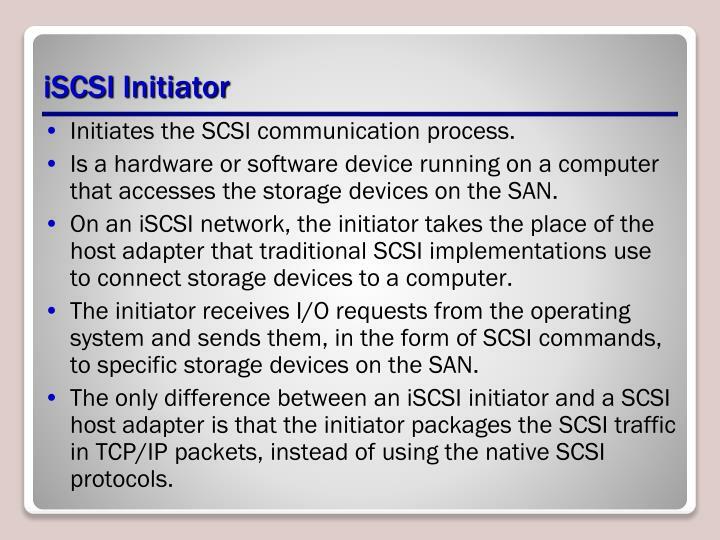 The only difference between an iSCSI initiator and a SCSI host adapter is that the initiator packages the SCSI traffic in TCP/IP packets, instead of using the native SCSI protocols. Integrated into a drive array or computer. 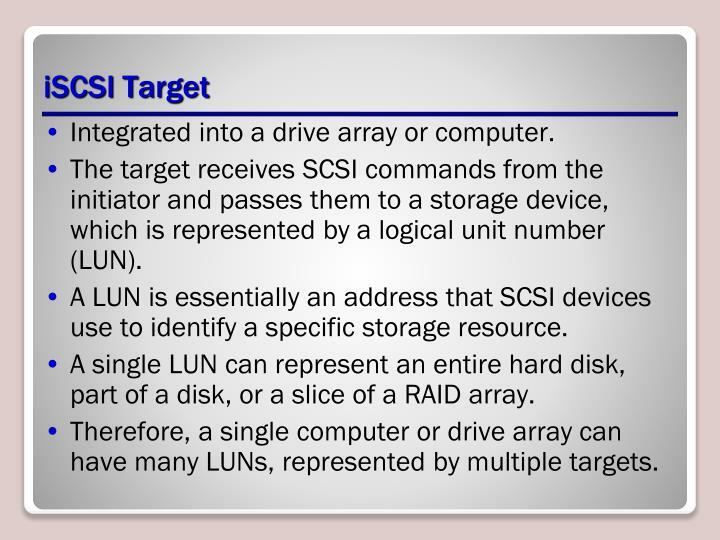 The target receives SCSI commands from the initiator and passes them to a storage device, which is represented by a logical unit number (LUN). 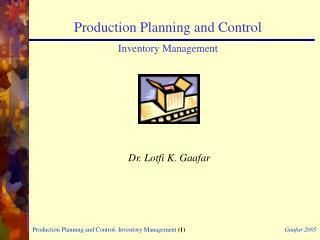 A LUN is essentially an address that SCSI devices use to identify a specific storage resource. 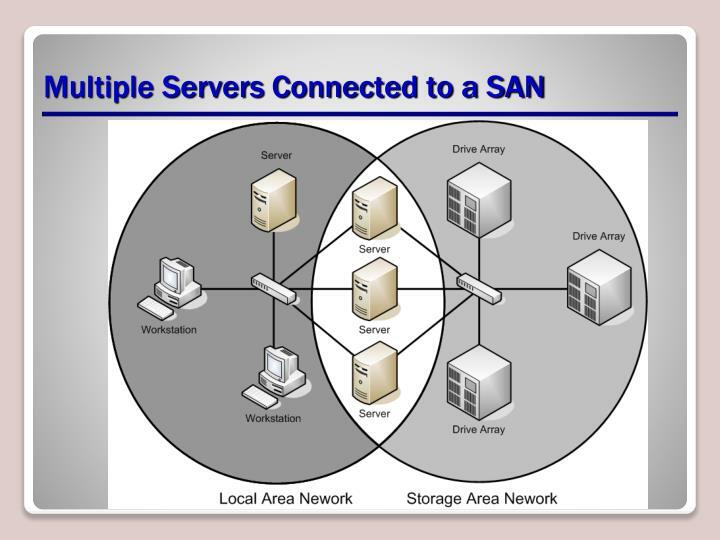 A single LUN can represent an entire hard disk, part of a disk, or a slice of a RAID array. Therefore, a single computer or drive array can have many LUNs, represented by multiple targets. 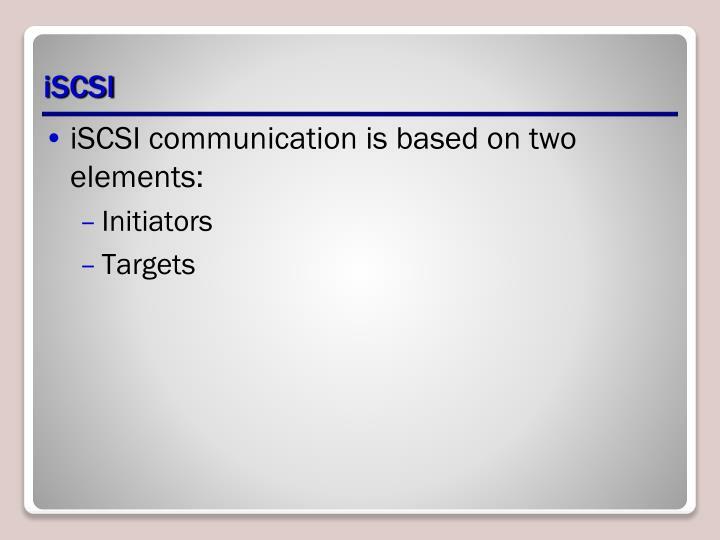 After the initiators and targets are in place, the only problem remaining in iSCSI communications is how the two locate each other. 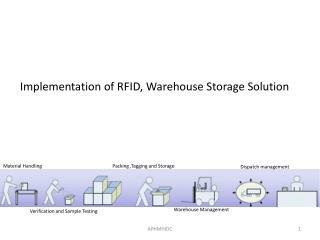 The Internet Storage Name Service (iSNS) makes this possible by registering the presence of initiators and targets on a SAN and responding to queries from iSNS clients. Windows Server 2008 includes an iSNS implementation as a feature, which can provide the identification service for an entire SAN. 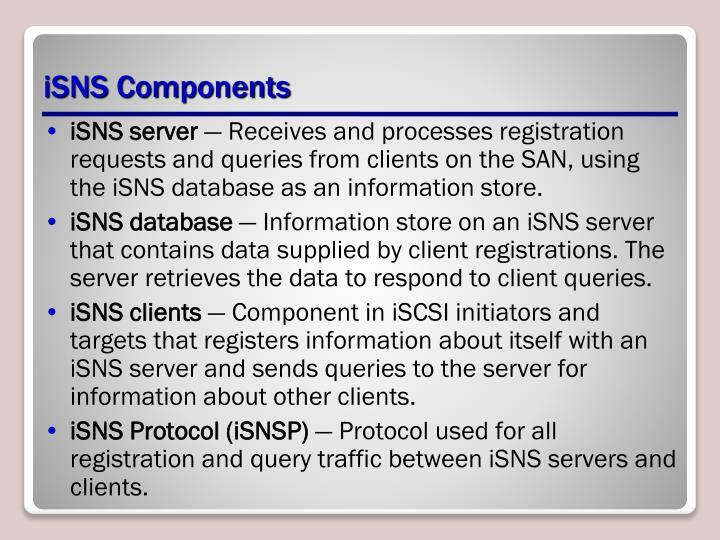 iSNS server — Receives and processes registration requests and queries from clients on the SAN, using the iSNS database as an information store. 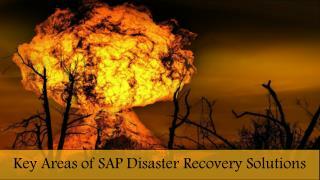 iSNS database — Information store on an iSNS server that contains data supplied by client registrations. 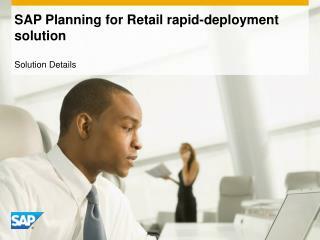 The server retrieves the data to respond to client queries. 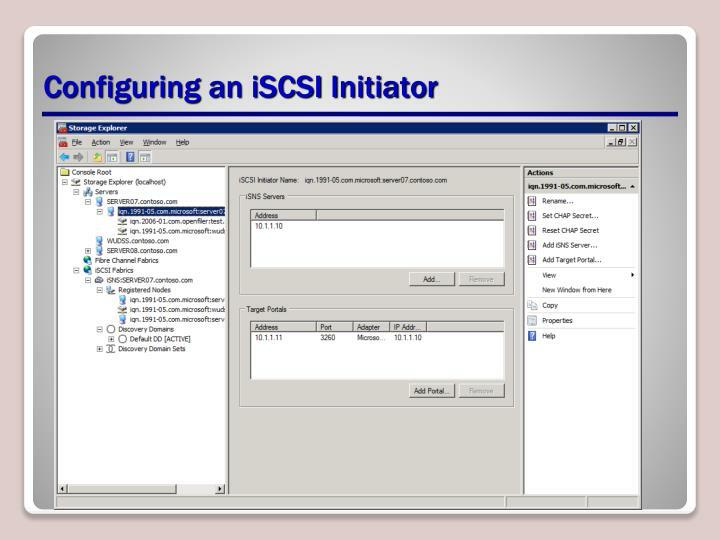 iSNS clients — Component in iSCSI initiators and targets that registers information about itself with an iSNS server and sends queries to the server for information about other clients. iSNS Protocol (iSNSP) — Protocol used for all registration and query traffic between iSNS servers and clients. 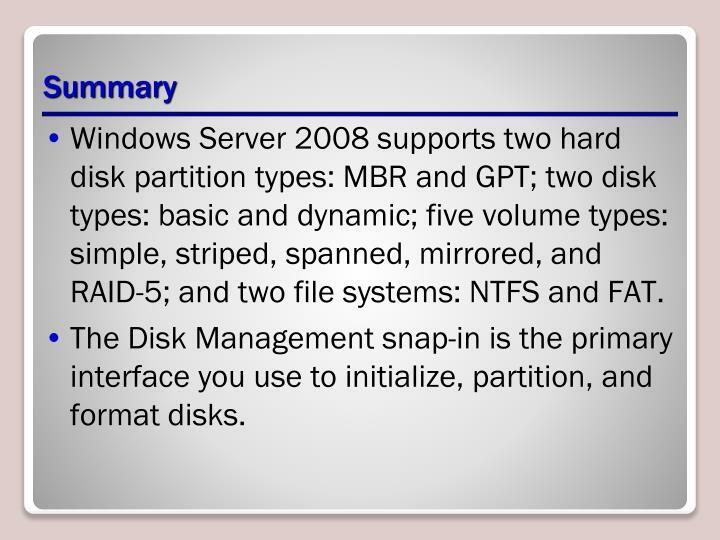 Windows Server 2008 supports two hard disk partition types: MBR and GPT; two disk types: basic and dynamic; five volume types: simple, striped, spanned, mirrored, and RAID-5; and two file systems: NTFS and FAT. 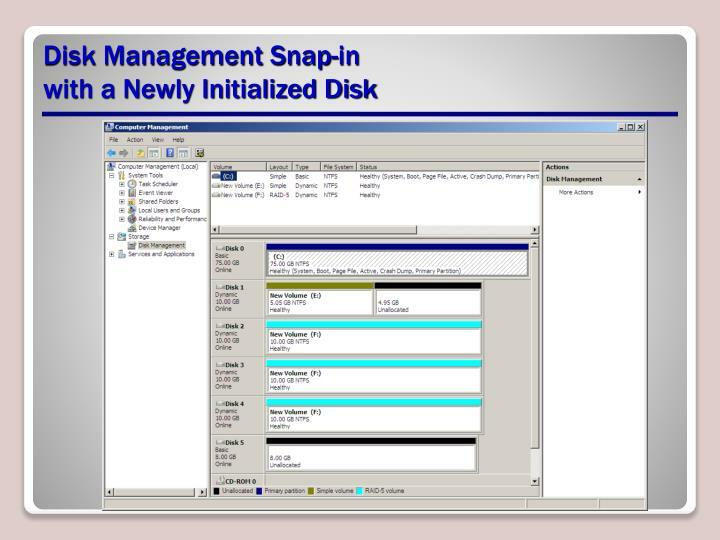 The Disk Management snap-in is the primary interface you use to initialize, partition, and format disks. 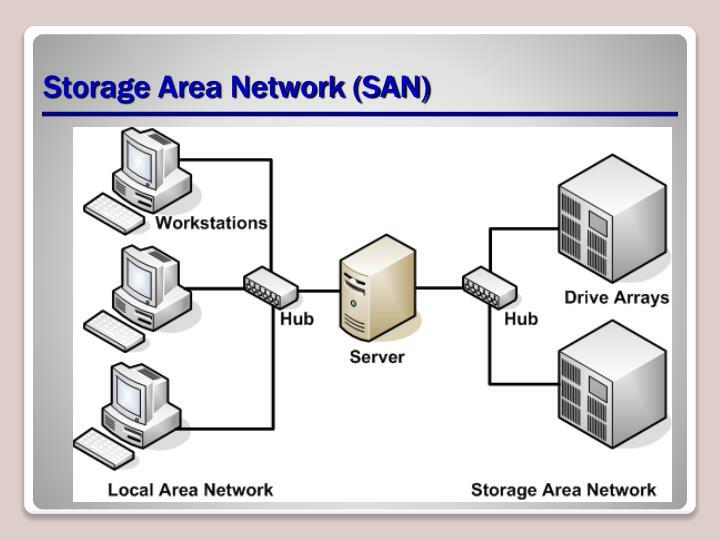 A storage area network (SAN) is a network dedicated solely to high-speed connections between servers and storage devices. 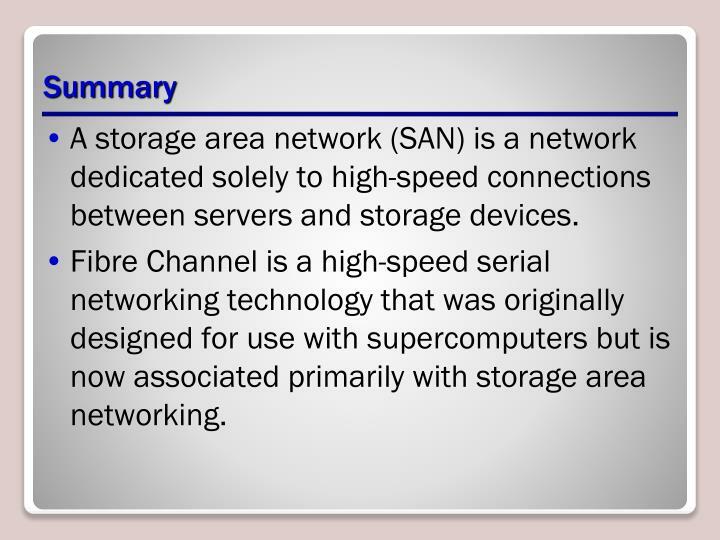 Fibre Channel is a high-speed serial networking technology that was originally designed for use with supercomputers but is now associated primarily with storage area networking. 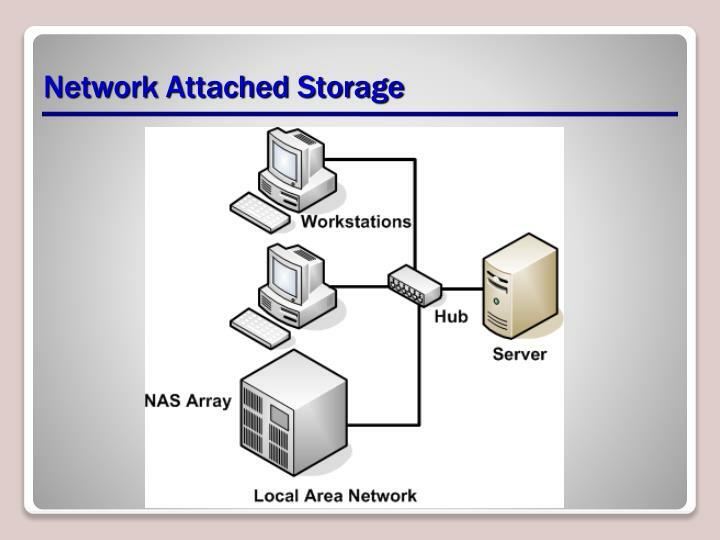 An iSCSI initiator is a hardware or software device running on a computer that accesses the storage devices on the SAN. 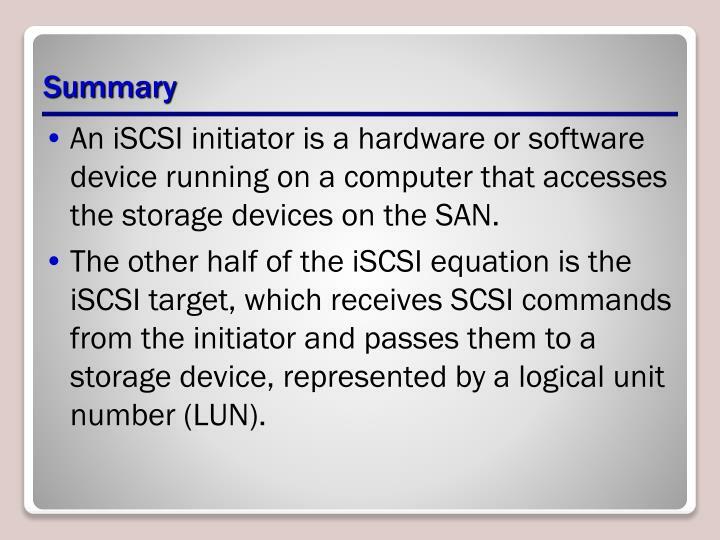 The other half of the iSCSI equation is the iSCSI target, which receives SCSI commands from the initiator and passes them to a storage device, represented by a logical unit number (LUN). 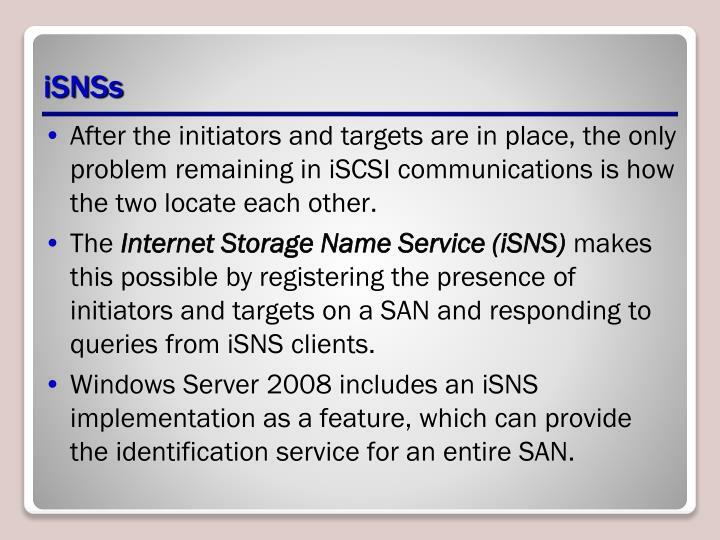 The Internet Storage Name Service (iSNS) registers the presence of initiators and targets on a SAN and responds to queries from iSNS clients. 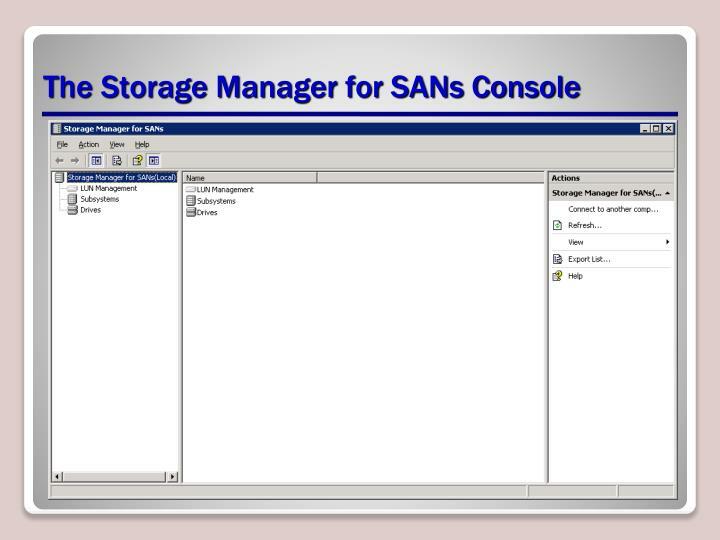 Storage Manager for SANs can manage only storage devices that include support for the Microsoft Virtual Disk Service. 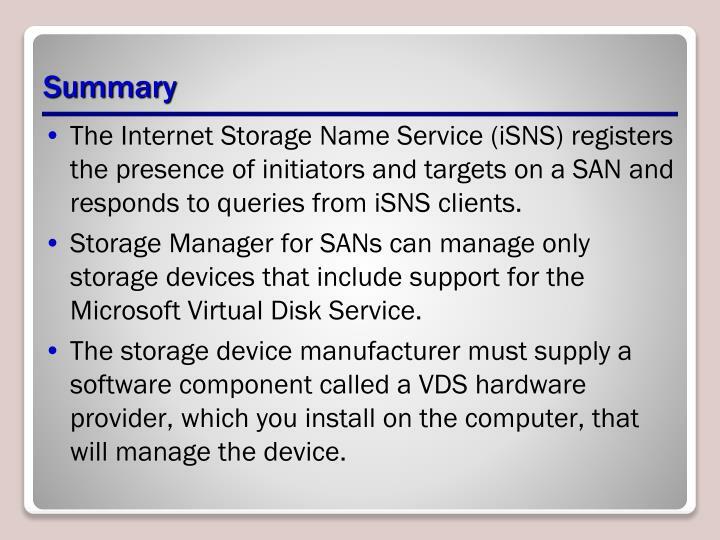 The storage device manufacturer must supply a software component called a VDS hardware provider, which you install on the computer, that will manage the device. 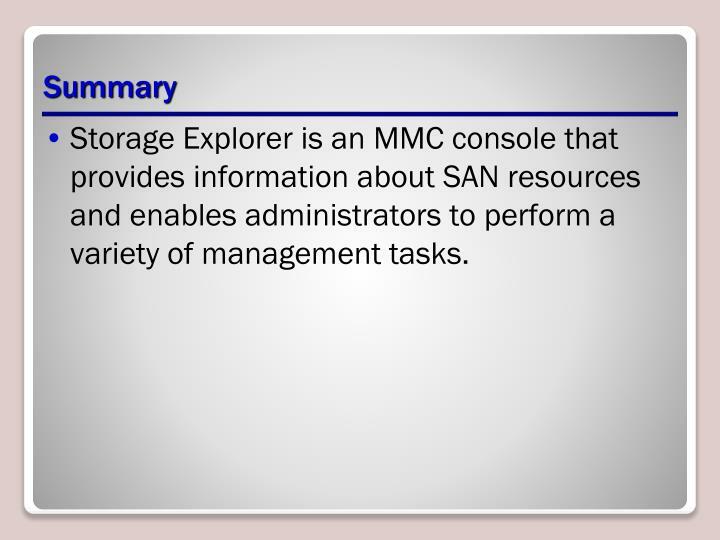 Storage Explorer is an MMC console that provides information about SAN resources and enables administrators to perform a variety of management tasks. 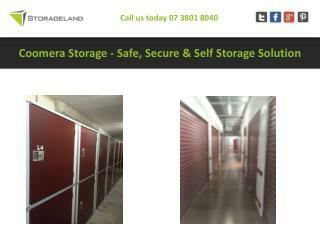 Coomera Storage - Safe, Secure & Self Storage Solution -Storagelandâ€™s clean modern yatala self storage facility is just 10 minutes from coomera along the m1 pacific motorway. 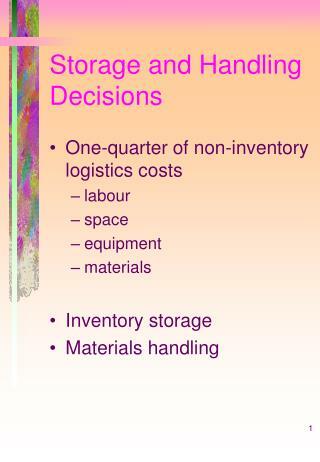 our coomera storage is the best storage facility in the area.